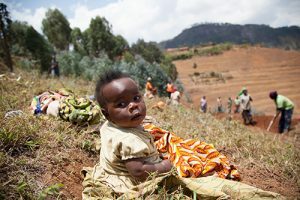 Children put to sleep on the ground, exposed to sun, wind and rain near dangerous construction sites – while their mothers work. Women without childcare facilities are falling ever deeper into poverty. Their children are missing school and sometimes watching over even younger siblings. The mothers are on the brink of exhaustion, caring for their children and working day and night. Public works programmes serve as an important safety net by providing temporary jobs to vulnerable households during adverse times. Yet, despite growing recognition that inadequate child care is an important issue, few social protection programmes offer viable solutions. In Burkina Faso, however, an innovative approach to public works and childcare is functioning, and gaining attention in neighbouring countries. Rebekka Grun, project leader of the Youth Employment and Skills Development Project, explained this innovative World Bank project to help readers better understand the potentially transformative impact such projects can have when they incorporate gender- and child-sensitive features. “In 2013, the World Bank launched the Youth Employment and Skills Development Project,” she said, “which supports over 46,000 young people through temporary work opportunities. Through a labour-intensive public works component, participants—most of whom happen to be women—are trained and recruited for six months at a time in jobs such as building roads, environmental projects and cleaning. Mobile childcare provision was not initially included in the design of the project. But during a field mission, the team noticed that many of the public works participants brought their young children to their work sites because they lacked stable child supervision arrangements. The children were next to active construction sites without any protection at all. Some would organise ad hoc care by having one mother watch all the children under a nearby tree – but with no stimulation or distraction for the children. “In this context, where women of working age can have, on average, 5-7 children, it quickly became clear that we had to do things a bit differently,” said Grun. Some mothers will take on jobs that pay by results, and work throughout the night when their kids are asleep – only to return at dawn to take on household chores. “So we decided to develop a solution that would encourage women’s participation in project activities, while allowing mothers to nurse their babies and provide meaningful care and stimulation for the children. “Since public works involve short-term projects, the solution was to provide mobile childcare (creche mobile or garderie ambulante in French). A project team conducted focus groups and interviews with public works participants, analysed the results and hired a regional early-childhood development expert. Although formalised child care was sometimes available, it was often unaffordable for the women concerned. It was also often located too far from the public works sites. Remote child care was not an option, especially for those with babies that needed to be breastfed. The team then developed a model of formalised mobile childcare that would follow women as they move from worksite to worksite. The idea was that it would be built using existing tools and services to a maximum, and by working with local partners – for cost-effectiveness and for sustainability. The proposal was shared with ministries and local partners – and it met with universal approval. Burkina Faso’s Ministry of National Education (in charge of 3-6 educational content) was particularly motivated as it had long been seeking to widen its pre-school network. Specialists from the Ministry of Women, National Solidarity and Family (in charge of 0-2 educational content), worked closely with the team. 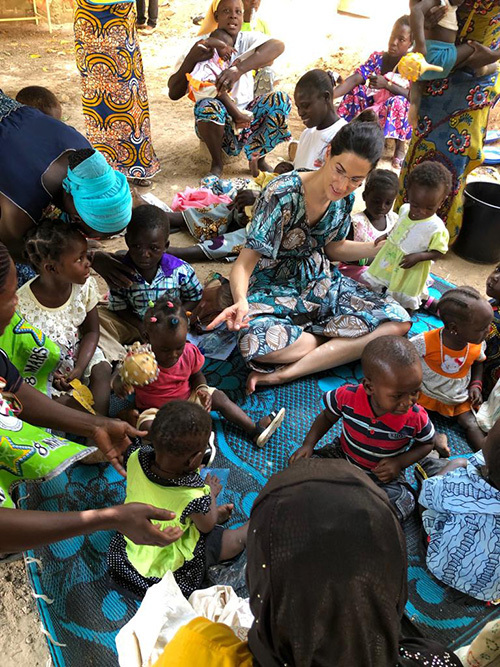 “Together we ensured that toys used complied with the Burkinabe standard toy list for preschools, and provided a stimulating programme based on the national preschool curriculum, which was amended for the needs of also younger children,” says Grun. Parenting educational content – that had been previously developed and used for the World Bank’s Burkina Faso Social Safety Net project – was also incorporated into the programme. The pilot also created a new public works stream. New jobs were created and women were trained as childcare assistants. Given that participants potentially use the childcare service for up to six months at a time (given the standard work-term), the project team reached out to the Ministry of Health and worked with local health centres. “We put in place a mechanism to monitor the health of children and ensure that they were vaccinated.” Local health specialists visit the mobile centres to check vaccination records and set-up appointments. Parents are also educated about where they can get free nutritional supplements for their families, and on child nutrition and general child care. The parental training materials used for the Social Safety Net project were successfully reused for this project. The mothers are offered information on topics that make the interventions more sustainable. Breastfeeding is encouraged, and opportunities to breastfeed are provided at the public works sites. In the six months that public works projects usually last, the creches mobiles will set up under a tree, or in an empty building offered by the local authority. Unicef donated a series of large tents designed specifically for children that protect against sun, dust, inclement weather and potential accidents. Local communal vehicles (usually one of the innovative “tricycles” – hybrids of motorbike and pick-up truck) transport the materials. All the materials are weather resistant, and in one location the local community has provided a climbing structure. This project helped create a new stream of jobs, with carers receiving the same wages as other workers. These jobs are often offered to pregnant beneficiaries or those unable to participate in manual labour. The project team, noting that many caregivers hold very basic levels of education, developed a system of training and support. The caregivers are trained by the Ministry of Education’s specialists with expertise in early childhood development. Women that show particular talent and dedication are offered an extra six months of employment in order to teach yet another cohort of children. Care work is often unpaid but by Creches Mobiles shifting care work from the unpaid domain into the paid domain, it comes with the added benefit of raising the prestige and profile of this kind of work. There are many ways that the project brings benefit. And what would be the cost and implications be of not providing care, Grun asks. Ex ante we would expect a variety of positive effects, which can be broadly grouped into (i) women’s work and productivity, (ii) children’s human capital and (iii) women’s agency. Makes husbands comfortable to let their wives work. They know their children will be well cared-for and receive developmental content. Contributes to reversing any biases when men and women are selected for Public Works participation. In theory, participation should be completely random, based on a lottery. In practice, local authorities have enforced quotas for men in varying degrees, sometimes claiming the nature of work was less suitable for women. Creates a new line of work and skills developing opportunities for women. Improves status of childcare work, often unpaid and rarely acknowledged as “work”. The early childhood content and play-based stimulation enhances the development of children and prepares them for school. Evidence suggests that the first five years are the most important for cognitive development and ultimately impact lifetime opportunities, such as income. The vaccination of children will not only protect the children but can reduce contagious disease transmission to other family and community members. Improves the educational outcomes of older siblings by freeing-up time that would otherwise have been used to care for siblings. Guarantees breast-feeding breaks and improves nutritional outcomes, minimising risks associated with mixing formula with unsafe water. Improves women’s bargaining power within the household. Parental training emphasises the rights and needs of women within the households, especially when pregnant and nursing. Ensuring female participation in public works could improve prospects for future project-planning. True Kindergarten Cop: The supervisor of the Creche of Manga. He has taken on the developmental content and sensitises Creche users and community about essential family practices such as handwashing. Some funding for this pilot is being provided through the World Bank financed project budget. It should be mentioned that the World Bank’s Early Learning Partnership (ELP) and its Umbrella Facility for Gender Equality (UFGE) financially contributed to the project, while, logistical and organisational support is contributed by local partners. Additional costs have been low, because much of the provision rests on existing public service providers from education, health and social protection. Service integration can be achieved with limited financial resources. Early lessons indicate that it can be replicated in different contexts, such as agriculture projects, refugee camps, outdoor work sites in general. Although the country context may vary, certain things remain the same and certain existing materials can be reused across countries, with slight modifications. There is no need to reinvent the wheel. The concept has already been shared, with two pilot sites having started in Cameroon in October this year. Following a 10-day study tour in Burkina, the Project team in Cameroon has attempted a three-month pilot version of the Creches Mobiles in a fragile area. They will also benefit from the help of regional ECD specialist Professor Oumar Barry, who helped configure and organize Burkina Faso’s Creches Mobiles. Madagascar is also interested and starting a pilot. After witnessing the work of the creches, it is valid to ask: Why didn’t this happen before? “I believe the project made a crucial difference by giving women, youth and children a voice,” says Grun. “Women, young girls and children are the primary beneficiaries of the creches, but they do not have prime agency. They have the least political power. Donor partners must stay involved to strengthen the key stakeholders, to make workers’ and children’s voices central to the daily running of public services. This includes sensitising and strengthening especially the community, “which needs to be 100% onboard, as they will ultimately be the hosts and drivers of the public works”. Rebekka Grun von Jolk is an economist with 20 years of experience working on the design, appraisal, implementation and evaluation of policies. Grun has worked with the World Bank since 2005, currently as team leader for Social Protection in the Africa region, and sometimes acts for the Chief Economist for Human Development. Before that, Grun was an advisor to the World Bank group president, and led her sector’s re-engagement in the Middle East/North Africa after the Arab Spring. Prior to joining the bank, she worked on the UK Prime Minister’s Strategy Unit and consulting. 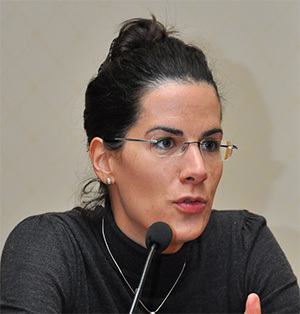 She has guest-lectured at Stanford and Georgetown, and received awards for her research and policy design work – some of which she has presented on international television. Her researchgate.net presence has several times ranked the most-read in her department. Rebekka Grun holds a PhD in Economics from University College London and a lic.oec. from St. Gallen.